My kids love Harry Potter and now they have the foamy mustaches to prove it. Butterbeer is the most popular food item at the new Wizarding World of Harry Potter at Universal Orlando. It kind of tastes like an ice cream soda, a little thick and very, very sweet. There is a little saltiness as you drink it down….definitely similar to butterscotch. In the Harry Potter book series, butterbeer has a bit of a drunken effect to those who choose to imbibe, this version is of course non-alcoholic. And when the author J.K. Rowling was asked what butterbeer tasted like…her reply, “I made it up. I imagine it to taste a little bit like less sickly butterscotch.” The version they sell at The Wizarding World was tasted and approved by Rowling herself. Butterbeer sold at the theme park is either regular or frozen and it seems patrons buy both to checkthem out. Anyway, because I’m just the coolest Mom (ha-ha) I thought my boys would enjoy whipping up some frosty, magical goodness and I was right!! They watched the Half-Blood Prince while they drank their libation and all was good in the their wizarding world. We tried a couple of versions with cream soda and root beer as the base. We liked the root beer version best sans the rum extract. Anyway, if you are enjoying the last few days of summer or looking for an after school surprise…butterbeer should be right up your alley. This sauce right here is one of the best I have tasted. Just like this it is the perfect ice cream or cheesecake topping. It is also what makes the drink so sweet. It’s so, so good. Anyway, in a small saucepan over medium, combine the brown sugar and water. Bring to a gentle boil and cook, stirring often, until the mixture reads 240 degrees on a candy thermomerter. I couldn’t find my candy thermometer so I used my wireless, digital meat thermometer and it worked fine. Stir in the butter, salt, vinegar and 1/4 cup cream. Set aside to cool to room temperature. Once the mixture has cooled, stir in the rum extract. In a medium bowl, combine 2 Tablespoons of the brown sugar with 1/2 cup cream. Using an electric mixer to beat until just thickened, but not completely whipped, about 2 to 3 minutes. 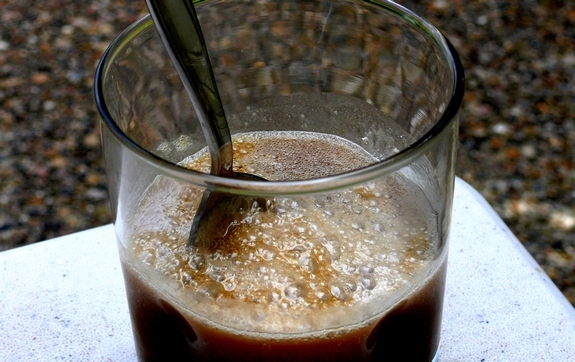 To serve, divide the brown sugar mixture between 4 tall glasses (about 1/4 cup for each glass). Add 1/4 cup cream soda to each glass, then stir to combine. 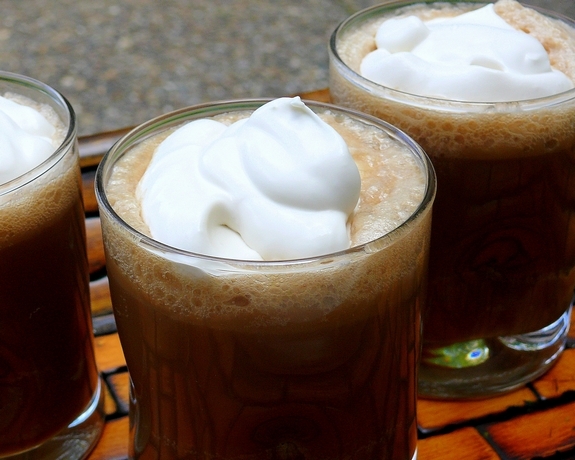 Fill each glass nearly to the top with additional cream soda, then spoon the whipped topping over each. Serve to a wizard or a muggle in your life, they will love it!! This sauce right here is one of the best I have tasted. 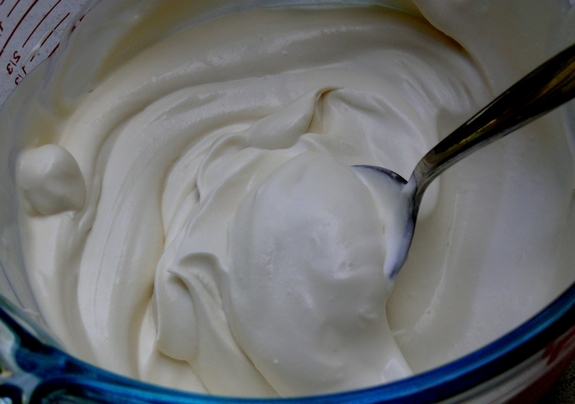 Just like this it is the perfect ice cream or cheesecake topping. It is also what makes the drink so sweet. It’s so, so good. Anyway, in a small saucepan over medium, combine the brown sugar and water. 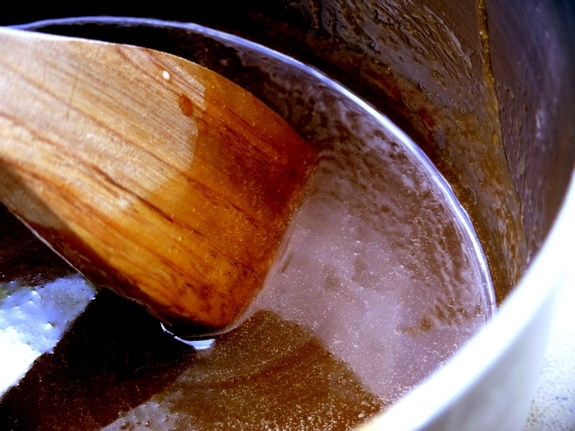 Bring to a gentle boil and cook, stirring often, until the mixture reads 240 degrees on a candy thermometer. I couldn’t find my candy thermometer so I used my wireless, digital meat thermometer and it worked fine. My kids liked the root beer version best when it was cold, so add some ice. They did not like the rum extract. This is very sweet so dividing it up among even more, smaller glasses is completely appropriate. It’s really the novelty of it all. How fun is that! And what a cutie drinking that butterbeer. I’ll have to try this! Of course they loved it! You are a super mommy! Looks delicious but it needs a couple of Lipitor mixed in. Oh. My. Does this look good, or what? And that last pic of your adorable son in those little glasses, my gosh, you got me!!!!! Hmmmm, I think I like the “idea” of it better than perhaps the actual drinking of it. It just sounds too sweet…and if it’s anything like butterscotch, forget it – it will gag all of the Muggles in this here asylum. I had to laugh when I saw Dan’s comment about needing a couple of Lipitor mixed in. I think he just might be right! Oh what a fun post! I must immediately share this recipe with a friend who is the biggest Harry Potter fan ever. 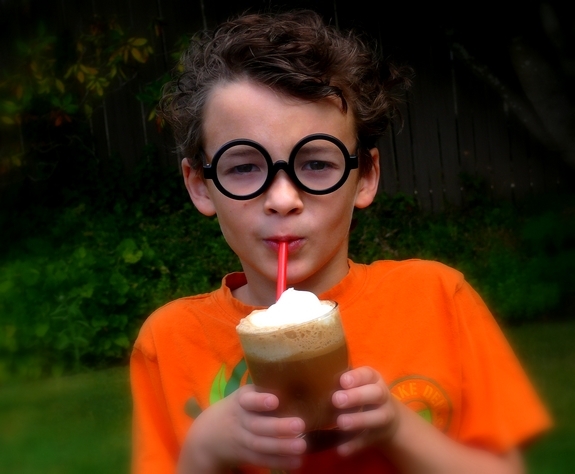 😉 Love the photo of your youngest hooligan drinking his butterbeer! AWESOME! We also love Harry in our house so will be trying this out ASAP! Thanks so much. Love this Cathy – my kids are not awaer of Harry Potter yet but they will be soon so thanks for the recipe. I love seeing your posts pop into my feed. He is so adorable Cathy, the drink sounds so scrumptious too. OH MY GOD!!! I love you! :D can’t wait to make these -yum! I love this concept. Your son looks awesome as always! Oh mu gosh, my daughter and I were just talking about this and debating what we thought it would taste like. We’ll have to give this a shot–maybe for Halloween. Thank you for sharing the recipe, and by the way, congrats on your winery being fully underway! So happy for all of you! Brilliant. I am having a Harry Potter B-day party for my son this will be perfect! Love this recipe!!! And the photos too!!! you totally are the coolest mom! That’s just the jauntiest, cutest boy I’ve seen! YUM! Can’t wait to try this…should I re-read one of the books or watch one of the movies, this needs to be in my hand. You totally ARE the coolest mom! Can you adopt me for a day?! LOL! I will for sure be making this for the new movie this November!!! Fantastic! Especially that dreamy photo at the end. You need to re-do this post for Halloween!! It’s perfect. I’m not sure what you would replace it with? Some specialists say that loan help people to live their own way, just because they can feel free to buy needed goods. Moreover, banks present bank loan for different classes of people. Why can’t you have the soda? If it’s the sugar you could use diet. This is delicious! We liked it best with cream soda, left out the rum extract. And the sauce is addicting! If you aren’t going to use soda, I would recommend sparkling water as a substitution. It will be much less sweet, but at least you’ll have the fizz right? I always wondered what butterbeer tastes like! wow! I got my daughter one of those butterbeer cups at Orlando and she still has it and drinks out of it!